Last week’s ASUS U41JF review is going to be the most interesting comparison to the K53E. Sure, that notebook only comes with a dual-core Arrandale i3-380M, but the 15% CPU overclock option, 83Wh battery, and GeForce GT 425M Optimus graphics give it a leg up on the competition. Yes, i5-2520M is going to be a faster CPU, but everywhere else I’d rate the U41JF as the superior laptop. Before we get to the benchmarks, though, let’s take a closer look at the K53E. The exterior and interior colors are an interesting shade of brown—almost a coppery color in the right light, and at other times the notebook can appear black. The lid is a textured plastic, which means that in normal lighting fingerprints don’t show up quite so well. Unfortunately, it also means that you can't easily wipe it clean with a microfiber cloth, and flash photography often brings out the greasy prints hiding in the indentations. I still prefer the silver styling of the U41JF (and other ASUS laptops), but the K53E doesn’t look bad. The 15.6”-screen chassis happens to be one of the least expensive laptop sizes these days. It’s large enough that manufacturers don’t have to work as hard at cooling or internal layout, but still small enough that they’re not wasting a lot of material. Unfortunately, our biggest complaint with the 15.6” LCDs floating around is that most are of the 1366x768 variety, and the K53E falls into that classification. We’d really like to see some better resolutions in 15.6” notebooks—even 1600x900 would be better than 1366x768—but then we’d also like to see LCDs that have a reasonable contrast ratio, maximum brightness, and color quality. In case you were wondering, the AU Optronics B156XW02 v6 panel used in this particular notebook has none of the good features we’re looking for and all of the bad. Yuck. 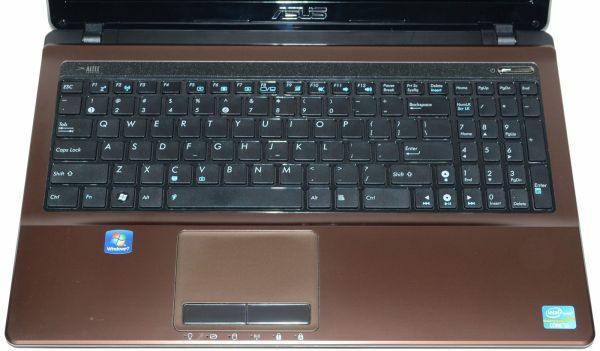 The keyboard is a traditional ASUS chiclet design, with the numeric keypad wedged in on the right. Like other notebooks, we’re not happy with the 10-key layout, mostly because the zero is half-size and the right cursor key overlaps the 10-key space. It’s not so egregious a flaw that we’ll spend a paragraph or two ripping on the layout, but there’s still room on the sides that ASUS could have used to give us a full 10-key with no compromises. Typing action outside of the 10-key is fine, and the dedicated navigation keys in the top-right (Home, End, PgUp, and PgDn) are certainly welcome. Something we do like with the K53E is the touchpad. It’s big enough to be useful without being so huge that you accidentally brush it while typing (and as usual, you can configure the touchpad to detect keyboard use and go to “sleep” for a short interval after typing to mitigate that particular problem). The tracking surface is also a nice, smooth texture and there are—gasp!—dedicated left and right mouse buttons. Why can’t we get these on the U-series? The palm rest is a nice metallic brushed aluminum finish, and the touchpad is slightly inset and has a different texture to help you find it without looking. Rounding out the package, the speakers are still a weak point—every time I fire up a game or play some music on Dell’s XPS 15 (the L502x now has Sandy Bridge CPU support; review is coming soon! ), just about every other laptop sounds horrible in comparison. Another big gripe I have is with the position of the AC plug. It’s on the left side, but instead of being at the rear of the notebook (as is usually the case), it’s located in front of the exhaust port. When plugged in, the AC cord gets in the way of the Ethernet, HDMI, and USB port on that side—or you can snake the AC cable around back, in which case you’re partially blocking the exhaust port. It’s not a big enough problem that you can’t use the ports while plugged in, but it’s just a weird design decision, particularly when you consider that nearly every other laptop puts the AC connector at the far back of the chassis. Looking at the whole, the K53E is a very reasonable notebook for the price. It’s not going to outperform quad-core SNB or gaming laptops, but it will run just about everything you might want with performance to spare. The price also puts it into competition with many inexpensive laptops, and it’s a major reason why we think AMD’s Brazos platform at $600 or more is a dead end. Even the i3-2310M will run circles around an E-350 (in both applications and games), so the only area where E-350 comes out ahead is battery life. With a better LCD (or at least a better resolution) and more connectivity options (e.g. USB 3 and eSATA), this could be an inexpensive desktop replacement for people that don’t need maximum CPU and/or GPU performance. With the current design, the K53E is a decent mainstream offering that boosts performance and battery life compared to the previous Arrandale offerings. Is that enough to warrant spending $100-$200 more compared to AMD Athlon/Brazos/Turion laptops—or Intel’s older Pentium and Core i3 systems? When you factor in the performance and build quality, I’d actually say that the $720 K53E-B1 is going to be a better all-around notebook than most of the $400-$500 laptops you can currently find at places like Best Buy. But then, I’d be far more likely to save up the remaining $80 to get a better GPU, like in the ASUS U41JF, or wait another month or two and see what AMD’s Llano APU can do for budget laptops. If you’re chasing lowest cost, small size, and battery life as your primary considerations, it’s difficult to beat HP’s dm1z, but as soon as you start customizing and approaching $600 (i.e. the Sony and MSI Brazos E-350 laptops), you have to look at the whole market and not just focus on netbooks.